This article originally appeared on Online-Christian-Colleges.net sometime around 2011. It has since been taken down. I am hosting it here as a resource for additional prayer blogs on the net. The links were tested December 2016 with broken links or old blogs moved to the bottom. The inclusion of the blogs are not an endorsement by the Prayer Coach site, but you may find useful information there. Prayer. It is a key discipline of the Christian faith and a commandment to all believers. Still more, Christians are commanded to pray without ceasing. Without ceasing? In today’s day and age, prayer can seem like a difficult task. How can one remain focused and listening to God’s voice when we have jobs and family and errands and commitments demanding our immediate attention? We suggest a little research. And we believe that this list is a good place to start. Explore these best blogs for prayer, and begin to pick up tips and useful habits for leading an unceasing prayer life. Heavenward: In the early morning, Scotty posts a prayer to this blog every day. He first opens up his post with a passage of Scripture and then uses that passage as a guide for his thoughts, praying with the written word. Why We Love It: We knew immediately that this would be our number one pick for this best prayer blogs list. Scotty’s posted prayers are packed with theology straight from the Bible. They are thoughtful and focused, of course, heavenward. We also love how Scotty is a member of the Gospel Coalition, and therefore, his work is under accountability to the other bloggers on the team. 24-7 Prayer International: 24-7 Prayer has no borders. This international, interdenominational prayer movement, which started as a student gathering in England in 1999, has spread to over one hundred nations around the world. 24-7 Prayer aims to cover all moments of time in prayer. This blog allows you to follow the endeavors of 24-7 Prayer and to learn about the power of praying without ceasing. Why We Love It: We love how this blog emphasizes how prayer doesn’t just happen in your little church at home. It happens around the glob e– and it makes a huge difference in the world! Prayer here is synonymous with action. Prayer Habits (now Jared Dees blog): Most of the blogs on this list either present prayer requests to the wider Internet community or feature personal prayers from bloggers. Prayer Habits is different. 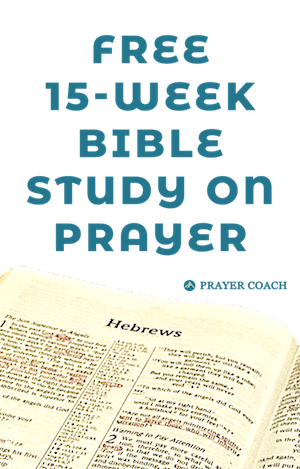 Prayer Habits is a blog that brings you many tips for building prayer into your life. It helps to give you a structure to your prayer life, advise you on ways to maximize your focus, and corrects you on the proper mentality that is necessary for righteous prayer. Why We Love It: This blog really seeks to help people establish a habit of a prayerful life because prayer is meant to be ongoing in all areas of life. Not just in times of great need. Prayer Coach: Kevin’s thoughtful and biblical posts on prayer are good nourishment for any Christian, whether you are a new follower or a longtime believer. All of these posts focus on Jesus and how Christians can serve him better. Persecution Blog: Jesus warned his followers that there would be immense persecution and trials if they were to follow him. For those who follow after Christ today, this warning remains true. Pray for persecuted Christians around the world by following this blog. Why We Love It: Here you will see updates and news on how you can pray for your brothers and sisters in Christ from around the globe. This publication of Voice of the Martyrs (VOM) leads you to pray for people who are suffering for their faith. A Blog on Prayer: These bite-sized, thought-provoking posts on prayer are filled with Scripture and small contemplations on how we ought to pray. Consider how to pray with humility, faith, and hope by following along with this blog. A Daily Prayer: Scripture says to pray without ceasing. This blog takes a step in that direction by posting a prayer every day. These prayers can act as prompts to your own prayer life when it is hard to pray. Bob Hostetler’s Prayer Blog: Writer and speaker Bob Hostetler shares his prayers on this blog. Read Bob’s prayers for all aspects of his life: prayers for vacation, holidays, spiritual guidance and growth, and more. chris erdman: These mini thought-prompts serve as great ways to begin out your time of prayer. See a daily photograph and short exhortation from Chris on how to focus your mind for prayer and meditation. Christian Women Today: Written for women, this blog features wonderful writing on living prayerfully. Prayer isn’t confined to a few minutes in the day. It infiltrates all parts of life, as this blog shows. Read about ways to rejoice, maintain contentment, and answer questions about prayer in the Christian faith. Christ Connection: Kevin Senapatiratne writes to encourage churches and small groups to raise up a movement of prayer. Prayer Connect: This blog is really a resource for daily devotions. But this blog makes our list for best blogs on prayer because of the “Prayer Points” at the end of each post. Study the Bible prayerfully by seeking Connection! Daily Prayer: Every day brings a new series of prayers, a thought-provoking quote, and a passage of Scripture. We love how this blog gives you multiple things to read and meditate on throughout your day. fly on wings of bluebirds: Brought to you with wonderful photography and a contemplative spirit, Renee shares with you her prayers, favorite quotes, and updates on her own life journey. Getting Down With Jesus: Is this blog explicitly about prayer? Perhaps not. At least, not at first glance. But prayer seeps into this blog as the writer considers the tough aspects of the Christian life. Read Jennifer’s “Rejoicing in the Midst of Pain” and “What It Means to Be Held” and see how conversation with God is part of her pondering about the Christian life. Power of Prayer: Everyone can use prayer. For those who don’t know where to turn, some online forums offer a resource for prayer. This is once such place. Submit your prayer requests or find a person to pray for on this blog. Power of Prayer Ministry: National Day of Prayer: On the first Thursday of May, the National Day of Prayer Task Force organizes a national movement. American Christians come together in prayer for the nation. Until that eventful day, the National Day of Prayer blog features some short essays from on maintaining a godly prayer life. Prayables Team Blog: Although this blog isn’t updated very often, we think that the content is worth exploring! Written by women and primarily for women, these writers share their meditations on being thankful, praying for their children, and fighting dark thoughts. Prayer A to Z: Stephen Nielsen used to work with Billy Graham’s Ministry praying for people over the phone. He has written several books on prayer and has regular blog posts for several years. Prayer for Everyone: Prayer for Everyone is a community of spiritual warriors. For those committed to prayer and praying for those in need, Prayer for Everyone invites volunteers to pray over certain prayer requests or over certain types of people (such as those struggling with their marriages or those in leadership). Prayer Pal: Beth Rudy consistently posts a passage of Scripture and then a prayerful contemplation daily for you to follow. Prayer, Plain and Simple: Ever feel like you can’t talk to God unless it’s REALLY important? The writer of this blog would disagree. Prayer Plain and Simple encourages you to talk to God about the trivial (“A Prayer for Those Still Waiting for Their Valentine”) as well as the major (“A Prayer for a Family Grieving the Death of a Child”). Praying in Color: Praying in Color is not just a blog. It’s a prayer practice and a workshop for a new approach to prayer. Sybil Macbeth introduces you to a creative way to pray: by utilizing art to pray visually, whether you are an artist or not! The Navigators Prayer Blog: This blog seeks to be a tool in covering the Navigators’ interdenominational and international ministry with 24/7 prayer. After reading through updates on the Navigators’ ministry, take special note of the red letters at the bottom so that you know how to pray for issues in your own life and to intercede for others who might need prayer. The Prayer Motivator: Through quotes and Bible verses, The Prayer Motivator provides you with bite-sized motivational material to lead you to prayer. The Praying Woman: Many posts on prayer written by women and for women. Women Who Pray: Teddi Holt is serious about prayer. Prayer is no simple or neglectable matter. It is hard work! And it oftentimes requires prayer when prayer is the last thing you want to do. So Women Who Pray is a call to those women who are willing to bear this commitment to a conversational faith with their God. Read excellent posts that cover all aspects of the Christian life, including prayer. Valerie Marie Paper: Valerie has several blog post on prayer, but her main resource is her prayer journal. 2RC Prayer Blog (last post Aug 2013): This church uses the Internet for a whole new use in their congregation: prayer! See how Two Rivers Church utilizes this blog to minister to their congregation. D.A.T. Ministries (dead link): Also from Reverend Terry, the D.A.T. Ministries blog brings you helpful prayers to guide you in daily life. You’ll have a passage to meditate on and then guidance on how to respond to the passage in prayer. Duke IV Prayer Blog! (dead link): This prayer blog alerts you to some issues in the world that need prayer. Although written to a select group, we think that many of these prayer prompts are worthwhile. Take a look at why you should be praying for Sudan and for those who pervert the gospel. Derek A. Terry (last post 2011): Reverend Terry’s paragraph prayers touch on everything from AIDS, to the struggle to remain a faithful Christian, to procrastination, and everything in between. But also take a look at some of Reverend Terry’s random collections of articles and quotes from around the web. Help and Hope Ministry – Praise Prayer Blog (dead link): This blog features excerpts from “A Treasury of Praise,” by Ruth Myers, and invites you to submit your own comments and prayer requests. Learn to take the path of recovery with this blog. JP’s Prayer Blog (dead link): JP Jones is the senior pastor at Crossline Church. His blog discusses Christian doctrine but also touches upon prayer. See Pastor Jones’ prayer requests for his congregation and read up on the importance of prayer in the development of the church. Little Prayer Box (dead link): People typically come and post to Little Prayer Box in dark times in their lives. There are confessions and many tears. But with a compassionate heart, many Christians come and support them in prayer in their time of need. If you desire to pray for others, this is a good place for you to look. Pray21 (dead link): Although this blog has not been updated in awhile, we thought that Pray21 was a good addition to this list. Pray21 is a project to reach young people through prayer. Over a 21-day period, adults and young people meet together to pray with each other and converse about what God is doing in their lives. The Pray21 blog features posts on random thoughts, prayers, and Pray21 initiatives. Prayer A Day (last post April 2013): Though this blog doesn’t strictly bring you one prayer a day, the writers of this blog generally do a very good job of keeping up! The prayers, which read like poetry, cover topics from praise to questions to hopes and doubts. 365 Days of Prayer Challenge (dead link): This blog is built solely around strengthening your prayer life using your head, heart, and hands. Read a passage of Scripture, pray, and consider how you might live out what lessons God is teaching you. If you crave structure in your prayer life, this blog is a great place to start. Bedashed Blog: All About Prayer, Praise, and Time With God (dead link): This site is like a Facebook for Christians with a number of “tools” thrown in to aid you on your spiritual journey. You can start a praise and prayer journal here, but this site makes our list for its prayer blog. This blog is filled with short prayers and some devotional thoughts on prayer and the Christian life. Prayer and Intercession (dead link): Though technically a blog, Prayer and Intercession is laid out more like a website, with special pages for posts. But we think the content is worth sharing! Check out the “Christian Blogs” section and read through experts of the book “Praying the Names of Jesus.” Or, see the “Common Christian Prayers” section to read up on how to pray effectively and to see examples of common prayers. Scripture and Prayer (dead link): After a good friend, Joanna, had suffered a sudden stroke, Michelle began this blog as a point where people could communicate about Joanna’s progress. In the meantime though, this blog has grown to include Michelle’s own contemplations on the Christian faith and the creation of other prayer vigils. Storms, Hope, Faith (dead link): We love the commitment Anna brings to her blog, “Storms, Hope, Faith.” Read daily posts about listening to God’s voice, the question of demons in the Christian life, and how to approach life with peace and faith. Also, if you are in need of prayer, make sure you click on Anna’s “Questions, Advice & Prayer Requests” page. Wycliffe Pray Today Blog (dead link): Wycliffe USA is an organization that translates Bibles to reach people who do not have the gospel. Their mission, Vision 2025, is to have a Bible translation by the year 2025 for every language that doesn’t yet have one. And their number one resource? It’s not translators or even more money, although those things are needed. It’s prayer! Follow the Wycliffe Pray Today Blog to support this ministry with your prayers. Worldwide Prayer Chain (dead link): The body of Christ is not just your own little congregation. The body of Christ is the powerful fellowship of true believers from all corners of the globe. Which leads to the existence of this blog. Worldwide Prayer Chain is a place where believers from all corners of the globe can be united in prayer. No language or denominational barriers! Learn to pray for your spiritual brothers and sisters from around the world by looking through the prayer requests on this blog. Contemplative Prayer Stations (now a book): This blog is a great resource for those in ministry to help their congregation to pray in a new way. Contemplative Prayer Stations posts creative ideas for creating space for people to come and pray at their own pace and at their own comfort level. But we think that these are great things you can do on your own as well. With God, for God (dead link): It is easy to see that Ilyn is bursting with joy. This joy leads her to an ever-growing desire to pray to God. This blog shows Ilyn’s prayers, short thoughts, and random contemplations on the Christian life. Letters to Jesus (dead link): Letters to Jesus is a blog that invites you to join in the conversation. Write your letters to Jesus. Tell him about your trials and praises, your questions and considerations. Read personal prayers, requests, and devotional life on the discipline of prayer. God Answers Prayers (dead link): This blog is a resource for all who need prayer. You can send your prayer requests anonymously to this site, where it will be posted and other Christians can come and support you in intercession. Further Up/Further In (dead link): This blog’s title is a reference to C.S. Lewis’ “The Last Battle.” In Lewis’s Narnian portrayal of heaven, the protagonists are encouraged to climb further up and further into the glories of God. This blog showcases random photos and humor, but also prayers, quotes on theology for edification. Daily Prayer (dead link): This is another “Daily Prayer” blog, but written in a different way! This team of bloggers at Daily Prayer generally provides you with a passage of Scripture and their own prayers and thoughts on that passage.